Warnecke Ranch stretches out over 260 acres of rolling oak woodlands in Sonoma County’s idyllic northeastern Alexander Valley, where coastal fog winds its way up the Russian River, and grapevines blanket the hillsides. Just east of Healdsburg, the ranch, which has been in the Warnecke family since 1911, has 80 acres of certified sustainable vineyards. Alice Warnecke Sutro spent childhood summers at the ranch. After finishing her MFA at California College of the Arts in 2010, she moved there to live full-time. Intending to focus on the Chalk Hill Artist Residency, cofounded with her aunt Margo Warnecke Merck Sutro also spent the next six years learning the ins and outs of wine production. “I wanted to live in the country, to be an artist out here, and to learn about the family’s grape-growing business,” says Sutro. At first, the transition from full-time student in San Francisco to assistant vineyard manager in Alexander Valley was a challenge. But Sutro discovered a love for wine and the business behind it. She’s since stepped away from the artist residency to focus exclusively on Sutro Wines. She purchases grapes from Warnecke Ranch & Vineyard for the label’s Cabernet Sauvignon, Merlot, and Sauvignon Blanc. The wines a reproduced at nearby Medlock Ames by her husband Eliot, a n architect and winemaker. 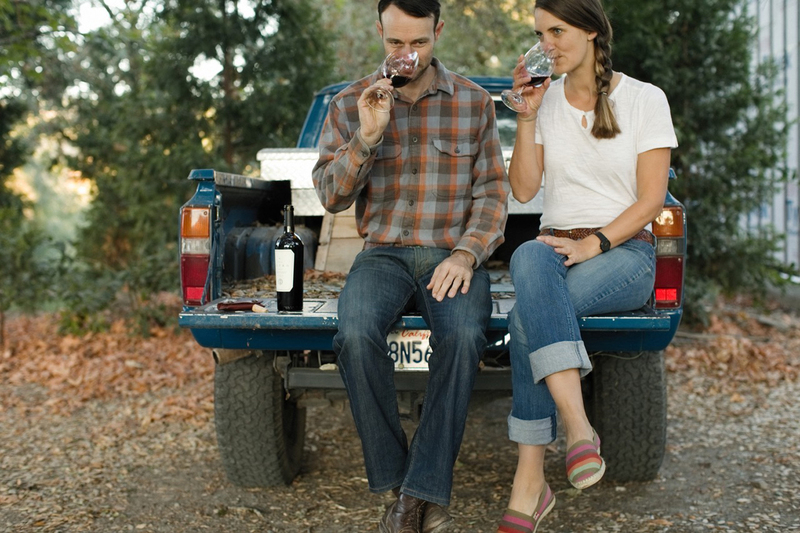 The couple broke into the winemaking world in 2012 and released the first bottles to the market in 2015. These days, Sutro is perfectly at home on the ranch, sharing her love for the land by offering nature walk and winetasting tours, quite literally in her own back yard. The tour begins at Sutro’s home, which she shares with Eliot and their two small children. From there, Sutro leads groups past 45-year-old Cabernet vines and up Chalk Hill, which Sutro describes as the “four corners” of a few of Sonoma County’s American Viticulture Areas (AVAs). The small hill, which was named for its just-beneath-the surface chalky white ash from nearby Mt. St. Helena, is the central connecting point for Alexander Valley, Chalk Hill, Russian River Valley and Sonoma Coast AVAs. Back at the base of the hill, the group heads west to a spot overlooking Brook’s Creek, a traditional Pomo fishing spot in the Russian River, continuing through lichen-draped oaks, and across lupine and soap plant-covered hillsides to the south and west. A terraced hillside of Merlot vines borders the walking path. Highlights include views of Mt. St. Helena, Black Peak, and the Geysers. Sutro’s background in art history shines through during the tour as she volleys about tidbits on viticulture and winemaking, the history and geography of the land, and noteworthy family history (her grandfather John Carl Warnecke designed the John F. Kennedy Eternal Flame in Arlington National Cemetery). The elder Warnecke’s architectural designs are found through the ranch, including a circular lookout over the Russian River and a tree tunnel along the ranch’s reservoir. The Sutro Wines nature walks launched in July 2017, and went through a brief hiatus after the October fires, which didn’t reach the Warnecke ranch. With a February 2018 relaunch, Sutro leads a few 45-minute nature walks a week followed by a tasting of three Sutro Wines (paired with mezzo or charcuterie plates) at either SHED or Jimtown Store in Healdsburg. $35 per person. Minimum two people, maximum 10. Allow 90 minutes for tour and tasting.